We can all agree that Miami is known for its eclectic culinary scene—especially offering you the best seafood festival eats anywhere. With the crystal blue ocean just steps away, seafood in Miami is second-to-none. 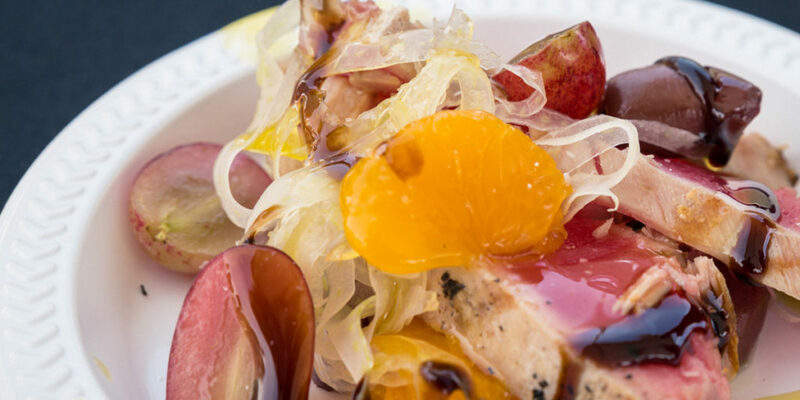 Nowhere else will you find such an incredible mix of restaurants, chefs, and flavors in one place. The only challenge is figuring out what to eat, but we’ve rounded up our top 9 dishes and took the guesswork out! So, are you wondering what culinary masterpieces you should be dying to try at South Beach Seafood Week? Take a look at nine unique eats that you’ll find at the best seafood festival happening in Miami in October. 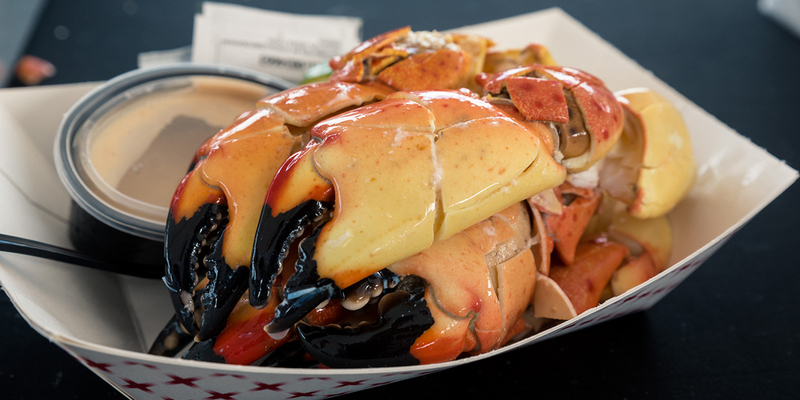 Where can you find the most delicious stone crabs in the nation? Only from the coast of Florida! These succulent crab claws are served fresh, ice cold, and pre-cracked for easy indulging. Enjoyed plain or with a touch of tangy mustard aioli, each bite is a juicy explosion of flavor. Once you try this delicacy, you’ll undoubtedly crave it outside of peak season. These sweet stone crabs are harvested fresh from October through May only. Don’t miss your window of opportunity! Where: #SobeSeafoodFest restaurants such as Joe’s Stone Crab, CJ’s Crab Shack, and Truluck’s will be serving them up. 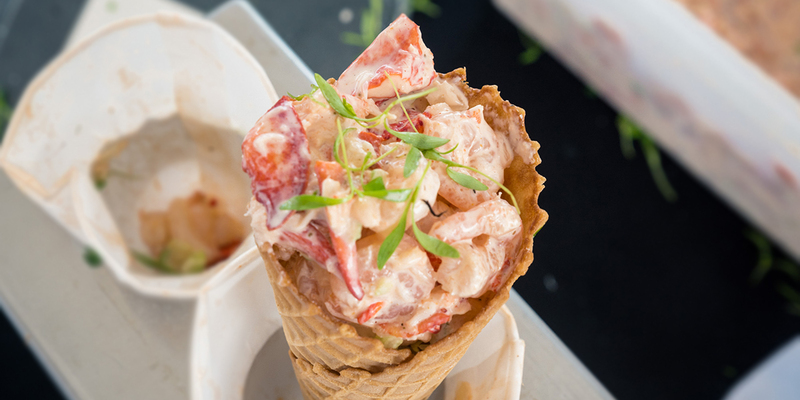 Any true seafoodie has had a lobster roll, but have you had a lobster waffle cone? This isn’t your typical lobster dish. It’s a cone filled to the brim with fresh lobster meat, delicious spices, and creamy sauce. We can’t give away any more details because this signature item’s recipe is top secret! 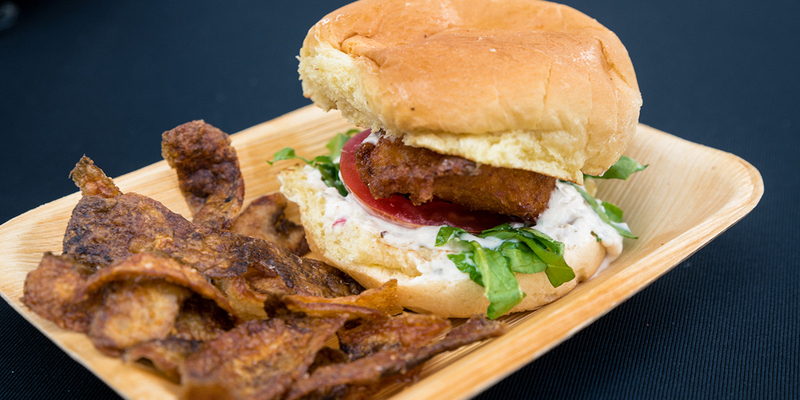 Festival-goers flock from all over the country to get their hands on this one-of-a-kind specialty that’s only available at the South Beach Seafood Festival event. You’ll love this dish for its easy-to-carry cone and unique flavor. Once you try one, you’ll realize why we’re one of the only east coast seafood festivals that acquired the exclusive for this! Where: Head on over to the Joe’s Stone Crab area to grab your lobster waffle cone and be sure to share it on the ‘gram! We don’t believe in Taco Tuesday. We think tacos should be available every day and in every way. That’s why we’re proud to be home to the Naked Taco Zone and the aptly named Key West Shrimp Tacos. 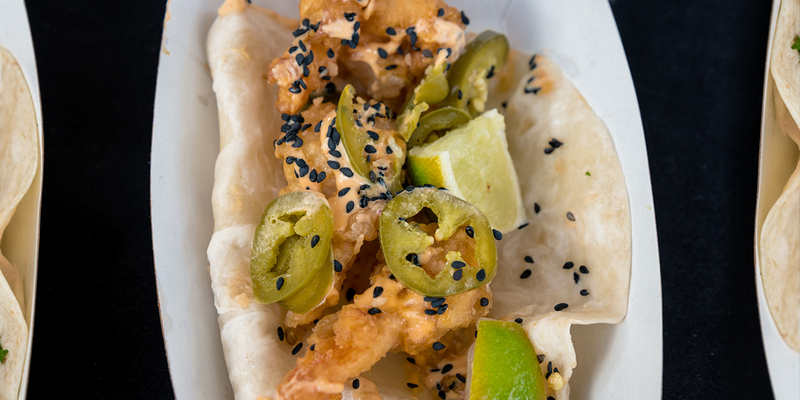 These tacos offer a decadent taste of Key West flavors and savory shrimp. Inside every bite, you’ll discover delicious flavor that includes cilantro, toasted coconut, jalapenos, sriracha, and more. We guarantee that you’ll want to grab a taco…or twenty! …and more! Is your mouth watering yet? Where: Head straight to the Naked Taco Zone for to-die-for dishes. Why settle for a plain bacon, lettuce, and tomato sandwich, when you can enjoy the amazing Scallop BLT? Found only at the best seafood festival in Miami, Papa’s Raw Bar pulls out all the stops for this festival-friendly dish. Discover what it’s like to take a bite of deliciously baked scallop, Japanese mayo, masago, cream cheese, avocado, and cucumber in one mouth watering sandwich. Try it with a beer or a glass of wine (because…open bar! ), and we guarantee that you’ll be hooked for life. And as a runner-up, don’t be afraid to try Papa’s Raw Bar’s fun twist on the classic chicken and waffles: lobster and waffles. It’s indulgent and super tasty. Plus, this is also a dish you can only get once a year – so you better enjoy it while you can! Where: Visit Papa’s Raw Bar for the Scallop BLT. If you’re looking for some delicious Mediterranean flavor, look no further than the Surf n’ Turf Gyro Wrap from Poseidon. This wrap is packed full of intense seafood flavor coming straight from the Greek Islands, where Chef Demetrios was raised. Stacks of seafood are complemented by fresh pita, bright spices, and special sauces. You will love it. Carved fresh to order and piled high with seafood, the Surf n’ Turf Gyro Wrap is huuuuuuge and authentic! Our mouths are watering just thinking about it. Where: Check out the one and only Poseidon Greek Restaurant for this unique spin on the classic lamb gyro. Mac N’ Cheese is one of those classic dishes that will never go out of style and always a comfort. But when you suddenly add lobster and crab to your Mac N’ Cheese, you’ve created a dish that’s elevated and decadent. And no one does it better than Chef Peter of Red, the Steakhouse. The best seafood festival in Miami is the only place to find this Lobster and Crab Mac N’ Cheese! In fact, it’s a world-famous recipe that’s as creamy as it is rich. Don’t say we didn’t warn you about its addicting taste. Where: Visit the Red, the Steakhouse Pop-Up Cafe for this world-famous dish. 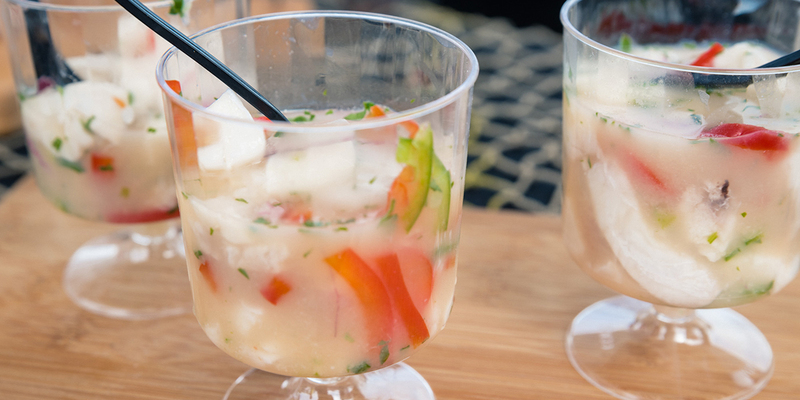 You knew we had to mention ceviche at a seafood festival in Florida! Number seven on our mouth watering menu is the citrus-infused mixed ceviche! Made in-house, this refreshing option has everything you’re looking for in an authentic seafood dish. It’s packed full of flavors you’ll love, like cilantro, lime, black pepper, and tons of fresh fish. Served chilled, this ceviche is extremely healthy! It uses acidity to cook the fish instead of heat ensuring ensures the seafood retains all of its original nutrients. Where: A Fish Called Avalon will be serving up our favorite ceviche and much more! What’s better than perfectly fried grouper on a freshly baked brioche bun? We can’t think of much! That’s why we love the Beer Battered GLT from the Rusty Pelican. This sandwich packs a punch with its beer batter that’s ultra light, but super flavorful. Inside every bite, you’ll find the freshest grouper, crisp lettuce, juicy tomatoes, and just the right amount of homemade tartar sauce. At the best seafood festival, we don’t skimp. Where: Head to the Rusty Pelican Pop-Up Cafe for the Grouper BLT. No seafood festival is complete without including a few decadent desserts. 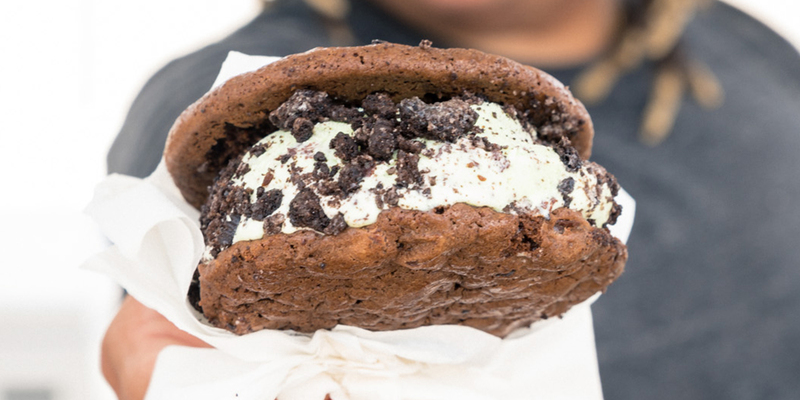 When you think of a perfect dessert on a summer day, you think of the Ice Cream Sammie from Wynwood Parlor. These handcrafted ice cream sandwiches are perfectly sized for eating on the go and boy are they tasty. Cool down with a sweet treat as you dance the day away! Wynwood Parlor always bring a number of their signature sammies and handmade cookies so you can choose your favorite. If you’re going to ‘gram it, better do it quick before the ice cream melts! Where: Get your sugar fix from Wynwood Parlor. There you have it, your Florida seafood festival eating itinerary is complete. Here’s a handy list of the mouth watering food you don’t want to miss, and it’s all at SoBe Seafood Fest on Miami Beach! Don’t forget the best part: all festival tickets include premium open bar and food is available for purchase at festival friendly pricing from $5-$10. We’re talking shareable appetizer-size portions, too (not your average one-bite tasting)! Have you attended our seafood festival in Florida? What’s your favorite mouthwatering dish?